I Love You More Than Carrots: Eat This: Do You Sprout? We Do! We all know that I make 95% of Carter's baby food. With the exception of whole grains and prunes, I'm always in the kitchen peeling, steaming, baking and pureeing delicious meals for my seven month old to enjoy. As a mom, we also know there are many things outside of our control as mothers. However, providing organic, safe and chemical-free food is one thing that we can control and that is important for me to do for my child. Here in the M household, we're making a concerted effort to be cleaner eaters. Why shouldn't Carter benefit from that, too? Now, I will admit that it's not always conducive to make Carter's food wherever I go. It's during those moments that we fill our travel bags with Sprout Organic baby food. I refuse to blog about products that I can't stand behind. With that being said, I'm excited to share with you my thoughts on Sprout Organic Baby Food and why I'm so passionate about their brand. Chef and Co-Founder Tyler Florence is the mastermind behind Sprout's delicious creations. More importantly, however, is that Tyler Florence is a Dad. On the Sprout website he states, "As a father, I'm always thinking how I can get my children to eat healthy, even when time is an issue. As a chef, I want to treat them to foods that are delicious and create a great relationship with a variety of foods. For my kids and for yours, I created Sprout and my recipes are designed to give our children the healthful ingredients and flavorful combinations they deserve for a healthy relationship with food from the start." I know, I know. You can easily just head to their new, easy to navigate website and read all about Sprout, their products and their values such as eco-conscious upcycling and community giving. That's why I need to tell you about my own experience with Sprout as a mom. Simple fresh organic ingredients. Easy to read labels. Heck, even if you didn't read the ingredient label, just opening the pouch and smelling what's inside- hands down you'll be able to identify the combination of flavors. Take a peek at one of Carter's favorites, Peach Rice Pudding. How can you argue with an ingredient list as simple as that? If that hasn't sold you yet, this pouch literally tastes like I just whipped up a bowl of my own Peach Rice Pudding in the kitchen. That's how each and every one of Sprout's Organic baby food pouches tastes. Fresh. Homemade. Delicious. It's baby food that's created and packaged in stages designed to grow with your child to provide a balance of healthy organic fruits, vegetables, whole grains and proteins. Easy to pack and easy to open. Super easy to store. Once opened, Sprout can be refrigerated for 2-3 days if by chance your little one doesn't scarf down the entire pouch. I wouldn't know, as Carter doesn't miss a chance to devour an entire meal in one sitting. I can't wait until Carter can enjoy Sprout's newest creation, their Advanced Meals. Beef and vegetable lasagna? Minestrone with beans and greens? Don't mind if I do! Before you run out to buy your first pouch of Sprout (or two!) make sure to visit their website to print off coupons to put toward your purchase! You can always keep up to speed with Chef Tyler and his latest creations on both Facebook and Twitter @SproutFoods. 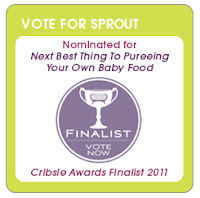 Did you know that Sprout is currently a finalist for the Cribsie Awards? Well, they are! And they need your help! What are the Cribsies, you ask? The Cribsie Awards are dedicated to recognizing the best brands, products, services, and websites for babies and tots. Interested in a chance to win a case of Sprout for your little one? It's really easy! The awesome folks at Sprout are giving away one case of Sprout Organics each week during the Crisbie awards, through March 18th. All you need to do is click the above logo and submit your vote for them! Once you've done that, go ahead and email Sprout at info@sproutbabyfood.com and let them know you've voted! Happy Sunday Readers! If you don't mind, I'm off to share a pouch of Peach Pumpkin Pie with Baby C! *the honest thoughts and opinions expressed in this post are indeed my own, although i was compensated with samples of the product for sharing these opinions. I've fed Brady sprout a few times but it is not at all my favorite. The pouches are good in theory but can be quite a pain. Once while we were out at dinner we ripped the top off but it didn't come off clean and we were stuck jabbing at it with a fork trying to get it open. I prefer a lid. Also, it is so expensive. Just under a dollar for one? No thanks. My favorite is Earths Best. Brady loves all of it, its organic, and I can recycle the glass jars. Not to hate on Sprout, I just don't really dig them. We love Sprout baby foods too!!!!! We've never ventured outside the world of my own creations but you're right, it'd be nice to have some back-ups all ready to go. And that ingredient list is pretty nice too. No citric acid to be seen! My friend uses sprouts baby food! G loves his homemade food...he eats it much more quickly and enthusiastically than when I've bought (Earth's Best) food. So I'll try this. Thanks for the heads-up on the coupons. We are trying the roasted banana & whole grain rice tonight!!! Can't wait! I'm passing this info along to my sister (she has a 3 year old and an 8 month old). I live vicariously through her since I am still baby-free at the moment. I don't think she's ever heard of this food before... I did tell her about the Mum-mum's and my nephew is addicted now! I don't have kids yet, but I really like the idea of making my own baby food when I do. Thanks for this tip. I'll have to save it!